Berkeley Kite Festival (7/28 & 7/29): Anyone attend? 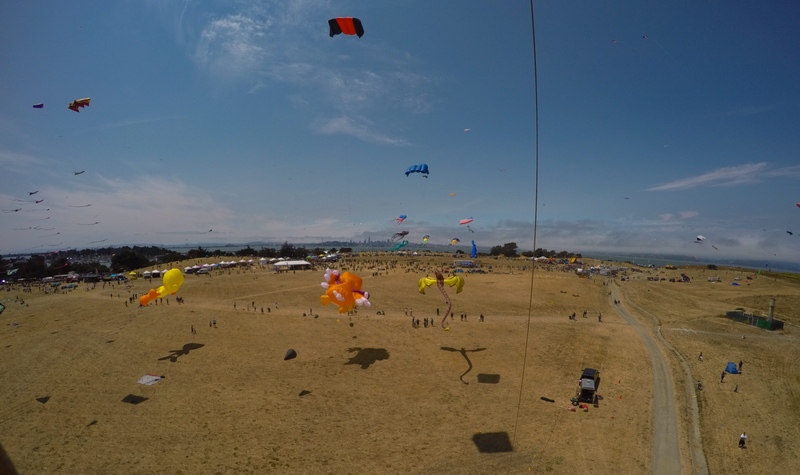 GWTW Forum > Kite Land Talk > Kite Land Events > Berkeley Kite Festival (7/28 & 7/29): Anyone attend? Anyone attend the Berkeley Kite Festival this past weekend? How was it. Did it have a good number of people attend? I was hoping to go, but going health issues with my uncle prevented me from going. Re: Berkeley Kite Festival (7/28 & 7/29): Anyone attend? I attended. As it was my first time, I can't attest to the crowd size although I did hear it was less than expected. It was fun, very windy as the breeze filled in. It's quite a spectacle watching all the people buy kites and then proceed to tangle them up and get them in the way of the pro's. I competed in novice sport kite competition and my wife and I flew some of our single lines and trialed a new KAP rig I made just in time for the event. I was there both days. Saturday was a bit light on attendance, but Sunday more than made up for it. Lots of nice kites and great flying. Check out the BASKL (Bay Area Sport Kite League) Facebook page for photos and videos. Used to go every year. But you’ll find me flying atte roundabout about every Sunday.